Council tenants are responsible for their own behaviour and that of anyone living with them or visiting their home. If there is evidence that they have behaved in a way which has caused annoyance, disturbance, or nuisance to others over a period of time, we can ask the Court for permission to evict them. The Courts view taking someone's home away from them and making families homeless as a very serious matter, and eviction is seen as a last resort. Cannock Chase Council will always take all reasonable steps to try to resolve tenancy problems using non-legal remedies such as warning letters, mediation, extension of introductory tenancy and acceptable behaviour contracts (ABC). However, if all else fails, the Council will apply to the Courts to reposess a property. The Neighbourhoods Team work closely with other key agencies when dealing with anti social behaviour (see leaflet below) ranging from the Police, Social Services, Education, the Probation Service, Youth Offending Team, Environmental Health and other service providers within the district. We also aim to ensure that residents are able to benefit from the peace and quiet of their home and surroundings and that any issues relating to the management of estates are identified quickly and prompt action is taken to resolve them. For further information or to report anti-social behaviour, please contact us on 01543 462621 or email us at EMTeam@cannockchasedc.gov.uk with your details. You can also refer to our Policy & Procedure Summary on Anti-social Behaviour (see leaflet below)and Anti-Social Behaviour and Hate Crime Policy. In certain cases of anti-social behaviour and neighbour disputes, Cannock Chase Council will use an independent from the Council mediation service to empower people to work together to resolve their problems. Solutions are offered by the parties themselves, enabling them to remain in control of any outcomes. Resolutions are only created if all parties are in full agreement. Agreements made are not legally binding, however, parties are more likely to adhere to them because they have created them themselves. Mediation is most likely to work in the earlier stages of a case; however mediation can still be effective in older cases. Mediation should not be regarded as a last resort when all else has failed, an informed decision should be made on a case by case basis. The following are some of the indicators which might suggest that mediation is ideal. Your Neighbourhood Team Officer will discuss with you if your complaint or dispute should be referred to a mediation service. Tackling anti-social behaviour is a key priority for Cannock Chase Council and other key organisations throughout the district. Please see our leaflet below on the Legal and Non Legal Tools for ASB currently being used by Cannock Chase Council in dealing with Anti-Social Behaviour. 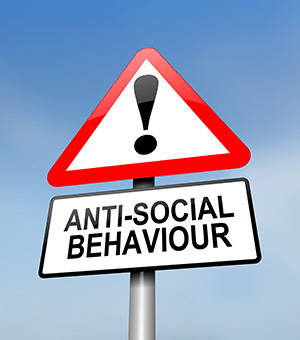 Cannock Chase Council, Housing Services want to make it as easy and simple as possible for our customers to report incidents of anti-social behaviour including 'out of normal office hours'. Out of Hours Calls will go directly through to an advisor. All calls received will be recorded and passed through to the relevant Partner Agency, this could be either the Police, Environmental Health or the Housing Services Neighbourhoods Team or Community Safety Partnership Team who will deal with the situation accordingly. If you wish to report a less urgent crime or disorder and for general Police enquiries, please contact Staffordshire Police on 101 or call Crime Stoppers anonymously on 0800 555 111. If your call is an emergency you must contact the Police on 999. You can also report anti-social behaviour on-line by clicking on this link 'REPORT IT'. For further information, please see, support for witnesses suffering from anti-social behaviour lealflet below. Hate Crime is any incident where someone has been targeted because they are believed to be of a different race, religion or gender or because of their sexuality or disability. As we are committed to tackling any kind of hate crime or incident that occurs in the district, we are working closely with the local hate crime partnership, Chase Against Crimes of Hate (CACH). CACH offer support to victims and also work with schools and colleges in the area to promote tolerance. To find out more, visit their website: www.cachpartnership.org.uk or email them at selfreport@cachpartnership.org.uk. For further information on all of the above, please see our leaflet Reporting Hate Crimes below. For reporting incidents of a criminal but non emergency nature please contact the Police on 101. REMEMBER - In an EMERGENCY please dial 999. Over the past few months, a number of nuisance tenants have found out the hard way what their persistent misbehaviour leads to. The Council's response has been evictions, court orders, 'demotions' for previously secure tenants and the signing of good behaviour contracts. During this period, the Council has followed up complaints from neighbours about all sorts of anti-social behaviour and in particular those who play loud music, cause problems with drugs and drinking. Excessive noise and providing a gathering place for gangs of youths are other problems, and one tenant has been taken to task for assaulting a Council Contractor! All the above are breaches of Cannock Chase's Tenancy Agreement, the contract a tenant signs with the Council before they get the keys to their home. The Council's introductory tenancy policy is that new tenants must serve 12 months on 'probation' before getting a secure tenancy. During that period those tenants who cause anti-social behaviour will be taken to task and lose their tenancy. Secure tenants can also be 'demoted' to the same status, as happened to one tenant from Rawnsley, following an assault on a Council Contractor. Any more trouble in the next 12 months and the tenant could be evicted. A secure tenant from Brereton, Rugeley had been causing serious neighbour nuisance and noise by playing loud music. During July, this tenant was taken to task and the Council obtained an order by the Court to seize stereo equipment from the property. The Court also granted the Housing Department a suspended possession order. This tenant will be evicted if further problems of this nature continue.